I struggled this past week with MORE FEARS of what “might” happen, tired and exhausted in this seven year season of house remodels, angry (fear-full) that I can’t control my environment and keep everything nice and in order, and then God uses a devotional passage from Jesus Calling, by Sarah Young, to drive home the point of PEACE in His constant presence. God has been shaking everything that can be shaken in the foundation of my life that doesn’t match up with His character, and confidence and TRUST in Him, rather than relying in myself and my own understanding. 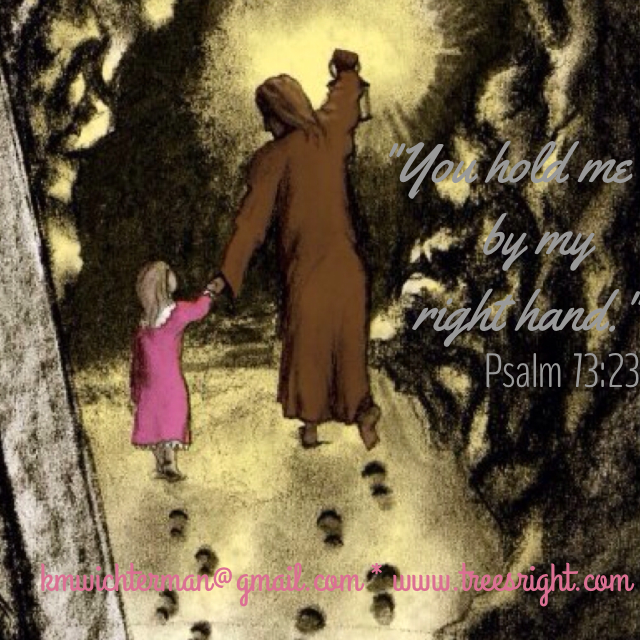 The picture above is the last illustration in my book, Darkness & Light – The Little Girl in Pink (A Journey from Fear to Faith), and depicts Psalm 73:23 (& found elsewhere in the Bible). God gave me the vision of this picture in 2002, before I had the revelation of His constant nearness in my life. And in the past few months, The Father has been reminding me over and over of His control when I trust Him, using this illustration from years ago! Thank you, Jesus, for guiding my steps by Your Holy Spirit, even when I struggle to believe. 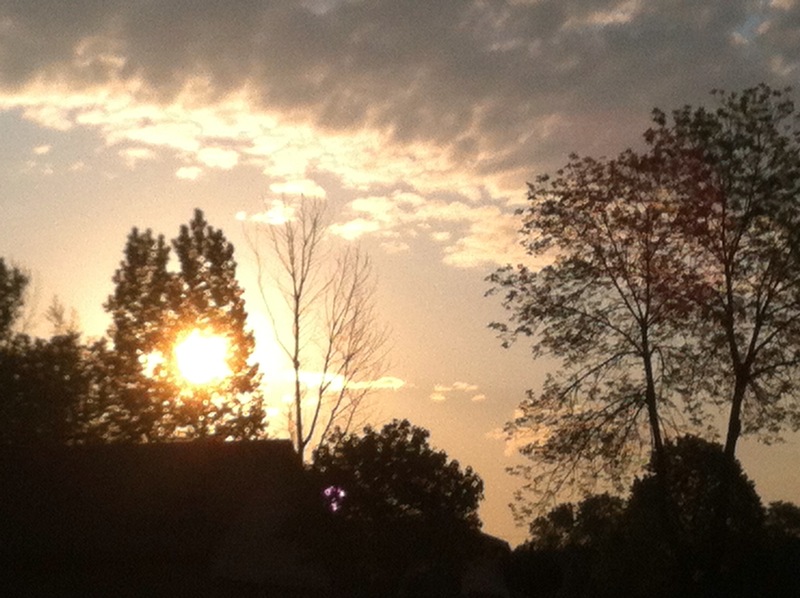 You hold my hand and lead me through the darkness of this life, bringing me into the fullness of your Truth and Light! I am forever greatful. To purchase the book, Darkness & Light – The Little Girl in Pink (A Journey from Fear to Faith) go here. QUESTION: If you were a tree, WHAT kind would you be, and WHY? Is “your tree” healthy, and showing evidence of growth and the ability to reproduce? Or, are your leaves withered, dry, and full of mites and disease? Your roots shallow, thin, and weak? WHAT IS CAUSING THESE PROBLEMS? Those are important QUESTIONS TO CONTEMPLATE! AN ALTERNATE LIFE is one where your leaves are lush and shiny, your fruit is abundant and inviting, your seeds are heirloom quality, and your roots are firmly, and deeply, established in a relationship and foundation with Jesus and The Father of Light? If you don’t know Jesus, or know of Him, but haven’t SURRENDERED your will to Him and want to know how, private message me on Facebook, or email me at kmwichterman@gmail.com (SUBJ: #KnowJesus). JESUS DIED as the pure and spotless sacrificial lamb, that sanctified your sins, and made a way for you to have ETERNAL SPIRITUAL LIFE. Then HE was RESURRECTED, and now lives to direct your steps (Proverbs 16:9), by Holy Spirit, healing and empowering you IN FELLOWSHIP WITH HIM to live a life worthy of His calling, as you lay down the selfish parts of your life, and choose to do His will to help others. “Though the tomato plants around us may be popping out some fruit, while we seem to wonder what is taking so long, our day will come. In 2007 my husband, Jim, and I were licensed and ordained as pastors. God gave us Isaiah 61:3 for our ministry name, but Psalm 1 is really important to us too. They’re both about how to be the BEST TREES WE CAN BE, and our website is ironically called http://www.treesright.com. I LOVE LEARNING ABOUT TREES, and how God compares us to them in scripture. It’s interesting how I connected with you through Compassion International, and how I was encouraged this morning at 5 a.m. by your Devotional quote above. It seems like my husband and I are FINALLY coming into a season of fruit bearing that we’ve never experienced before. And in this Jubilee year of 2016, it’s a RELIEF to see that The Lord is “RESTORING what the devouring locusts have eaten.” Patience in perseverance pays off in producing sturdy storm withstanding trees! Blessings in your FRUITFUL TREE endeavors for the glory of our King! This is an excerpt from Managing Money God’s Way that I’d like to share with you today. I hope it helps as much as it has helped me! In my case I have been diligently trying not to “walk in the counsel of the wicked,” and it seems to be making my answers to prayer take even longer. I have been earnestly trying to do things the right way, knowing full well that by cutting a few corners or compromising my values I could make the answers appear faster. The major difference being that I can get mediocre answers doing it my way or the fruit God promises by doing it His way. If we do these two things, we have the promise that whatever we do will prosper and that we WILL bear fruit IN OUR SEASON. As I was staring at this tree I began to realize that trees grow slowly. You plant a seed for a tree and it takes a while to sprout and takes a while to grow to a decent size. Grass and even plants, on the other hand, grow a lot faster. They sprout up quickly and sometimes you can even notice growth one day to the next. Then it kind of hit me that God wants to make me “like a tree.” He isn’t interested in seeing rapid growth that will not make it to the next season and is ultimately unsustainable. A tree, though it grows slowly, becomes a lot more sturdy and is able to withstand challenges that grass and plants can’t. I am reminded of a storm we had last year that snapped my tomato plant right in half. The plant had grown to about 2.5 feet in a matter of months and was not strong enough to survive when the winds came. God wants to make us strong and sturdy to withstand the storms in our lives. I am excited about the tomatoes that my plants will produce this summer, but even the best tomato plant would be lucky to produce 40 lbs of tomatoes in a season. But mature apple trees can produce over 1000 lbs in a season. The downside, of course, is that trees don’t bear fruit 3 months after you plant them like many vegetable plants will. Some trees will take a few years or even longer to bear fruit. I remember the frustration I had with this when I wanted apples from a new tree and learned that I may have to wait a while. Patience seems to be a rare virtue in our society these days, but it is one that we ought to develop. God seems to like taking the long road with a lot of things and as I begin to see the reason behind it, it causes me to say, “huh, God really is smarter than I am.” ? It’s tough watching the grass sprout up all around you and seeing others bearing fruit when you have been faithfully doing what is right, but we must not be short-sighted. We need to try to look at these things the way God sees them. Though the tomato plants around us may be popping out some fruit, while we seem to wonder what is taking so long, our day will come. God is doing a work and creating something in us that will be around long after the grass has come and gone. Like I mentioned earlier that is an excerpt from the Devotional that I find that I still need to hear years after I wrote it, so I hope it helps you! If you are interested finding out more about it or getting an audio or kindle version, head over here! P.S. While the book sales do help me feed my family, we donate 34% of all profits to Compassion International: a great Christian organization changing lives. So if you pickup a copy, know that your dollars are impacting the world!